MK Muallem pays a visit to Samaria town facing destruction due to a Supreme Court order, and promises to help find a solution. MK Shuli Muallem, chairperson of the Jewish Home faction, arrived on Sunday to Amona in the Binyamin district of Samaria to meet with leaders of the struggle to save the town. Muallem's visit was intended to form a plan of action in the Knesset to legalize Amona's status and prevent the residents from being expelled from their homes. 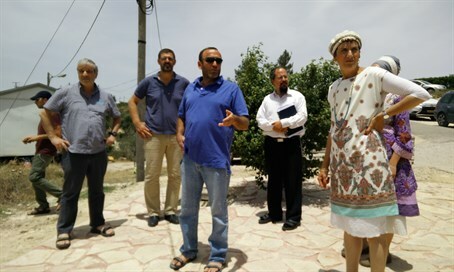 Amona, which was built on land purchased from Arab residents, has been deemed illegal by the Supreme Court, which has rejected the validity of the deeds to the land provided by the town’s founders. Last week it was reported that a deal was being worked on to evacuate the town in return for the building of a new town in the region, but residents have rejected the idea. Radical leftist organizations petitioned the Supreme Court to get Amona declared illegal, and the court has ordered the state to completely demolish the town by December 2016. Attorney Avichai Boaron, a resident of the town, said, "the solution that will save the homes of Amona will save thousands of additional homes in Judea and Samaria that are in an identical legal status to that of Amona. That is one of the central reasons that we oppose the proposal to move the town to another location. There is a matter of principles here." Boaron added that he expects the Jewish Home party to step up and use its position in the government to stop the eviction. "You don't destroy or expel a Jewish town, particularly when it's a town that was established dozens of years ago under the patronage of the state, and people established their families there." He noted that residents "live in uncertainty because the state itself is not acting to find the legal solution," in a criticism of the government for its inaction on Amona that comes in addition to its covert general building freeze in Judea and Samaria since 2013. During the visit Muallem said that the government understands that Amona needs to have its status legalized, and that moving the community is not the right solution. "The solution that will be found in Amona requires creativity by the governmental sources, it will solve not only the problem in Amona but will also influence other homes that are in the sights of the radical leftist organizations that took as their goal to harm the communities in Judea and Samaria," she said. Also taking part in the meeting was Yesha Council chairperson Avi Roeh, who warned that leftists are using the judicial system in order to destroy existing communities. "This is a strategy that they are trying to implement also in additional places," he said. "The issue is that harm to Amona will have serious repercussions on other buildings because from a legal standpoint there is no serious different between hundreds of homes in the settlements and what's happening here, and therefore we must struggle for this place." Amona's Chief Rabbi, Rabbi Yair Frank, thanked Muallem for her visit and for efforts to save the town. "We expect from all those (in the Knesset) who identify with the nationalist camp to come and make an ethical, spiritual and moral statement, that the town of Amona must be legalized - both for the land of Israel and also for Zionism and the settlements, and of course for the families that live here." "It is true that the solution of moving the town could give us the opportunity of having nicer buildings and a nicer environment, but we refuse to accept this solution, not only because we have connected to this place, but because we are aware of the future ramifications of its implementation," said the rabbi. The struggle for Amona dates back, as the High Court in 2006 ordered the demolition of nine houses which it claimed were built on privately-owned Arab land. Thousands of Israeli police and soldiers were called in to remove demonstrators. Hundreds of civilians were wounded in the course of the evacuation, including several Knesset members. Witnesses accused security forces of using excessive force and in some cases, outright brutality.